Several bloggers specializing in defaming us and our Catholic apostolate have recently leveled the vicious libel of “racism” at us. To answer some questions these postings have generated, I offer the following observations. The accusation that Father Feeney and Saint Benedict Center are “racist” is utterly false and libelous. We deplore and condemn racism of any sort. The accusations, copied on various blogs, cite the same witness as an authority. Take, for instance, this reference: “Grace Uberti 14 September 1952, Feeney Collection, Archives, Archdiocese of Boston.” Grace Uberti was an avowed enemy of Father Feeney and made patently false accusations against him. She and her husband opposed their daughter’s vocation to the religious life so much that Mr. Uberti once ran his car onto the sidewalk, aiming the automobile at his own daughter, Evelyn, who thankfully jumped off the sidewalk. This strange act of terrorism was apparently a failed attempt to frighten Evelyn (Sister Mary Immaculata, M.I.C.M.) away from Father Feeney and Saint Benedict Center. Mr. Uberti had to be physically stopped from harassing his own daughter. But Mrs. Uberti’s weapon was more subtle: the pen. Having interviewed several people who were present when Mrs. Uberti supposedly heard these statements (public talks on Boston Common), I have come to the conclusion that her reports are a tissue of lies. I know people who were there and they vehemently deny that Father made those remarks. Notably, in the days when Father Feeney supposedly said these things, he had also made himself unpopular for defending the Japanese people against the very popular dehumanization inflicted upon them as part of World-War-II era propaganda. 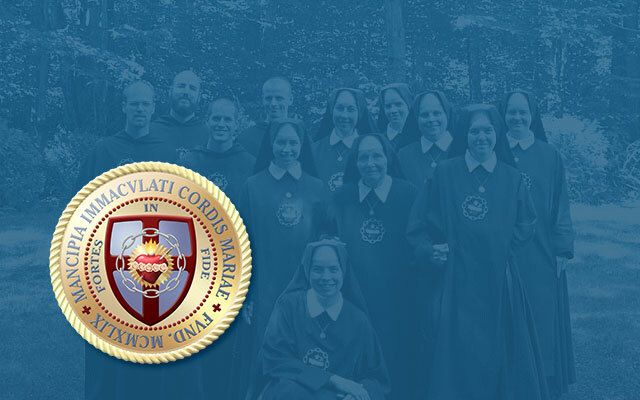 Another notable fact is that an early member of Saint Benedict Center was one Muriel Vincent, a black lady who entered the Slaves of the Immaculate Heart of Mary with the religious name, Sister Mary Clare. Muriel was a convert of Father Feeney’s, and Brother Francis was her sponsor when she was received into the Catholic Church by Father Feeney at Saint Paul’s parish in Cambridge, Massachusetts. After entering the Order, she would have been present, with the other brothers and sisters, when Father was allegedly demonizing her people on Boston Common. Among the religious here, there are brothers and sisters of Arabic, Norwegian, Spanish, French, Polish, Irish, and American Indian ancestry, to give an incomplete list. Our office staff includes men of Jewish and American Indian descent. The Jewish man is the son of a convert, who was converted (among other reasons) because of the charity he was shown by members of Saint Benedict Center. Even before his conversion to Catholicism, Israel Cohen did volunteer work at Saint Benedict Center. Among worshipers at our Latin Mass have been natives of Argentina, Sierra Leone, Mexico, Lebanon, Brazil, Japan, Germany, Hungary, Poland, Finland, and the Czech Republic. Many of these are regulars. Priests from India, Nigeria, the Philippines, Ireland and Uganda have offered the Latin Mass for us. I personally have served the Holy Sacrifice of the Mass for all of these, as well as African-American priests. As the traditional ritual requires, I kissed their hands at the proper times, just as I have kissed the hands of Austrian priests, French priests, and American priests of various national backgrounds. Click here for a the picture of our student body that we have had on our site for some time now. Pictured are two African-American students, two students of Arabic (Iraqi) descent, two Sisters of Lebanese descent, as well as students of French, Irish, Austrian, Hungarian, German, and English descent (to give a partial list). The Catholic Church is “catholic,” i.e., universal. Our little community here is very representative of the Church’s catholicity and ethnic diversity. The charge of racism is just as foolish as the charge of Anti-Semitism, which has been capably addressed by Mr. Robert Cohen.